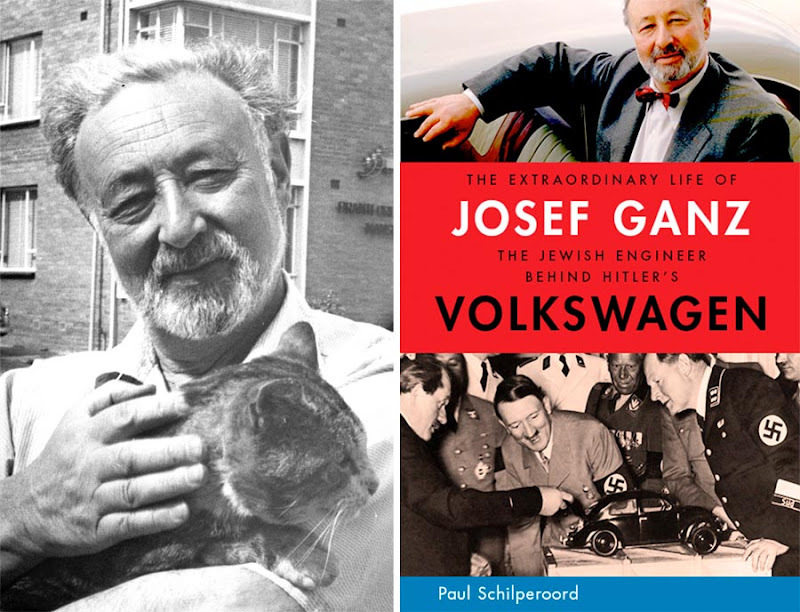 Finally, the full story behind emergence of Volkswagen, "Hitler's pet project"
We welcome back our contributing writer Paul Schilperoord, whose book “The Extraordinary Life of Josef Ganz – The Jewish Engineer Behind Hitler’s Volkswagen” has just been released in the US and Canada. “The Extraordinary Life of Josef Ganz” tells the astonishing story of Josef Ganz, a Jewish engineer from Frankfurt, who in May 1931 created a revolutionary small car: the Maikäfer (German for May Bug). Seven years later Hitler introduced the Volkswagen. 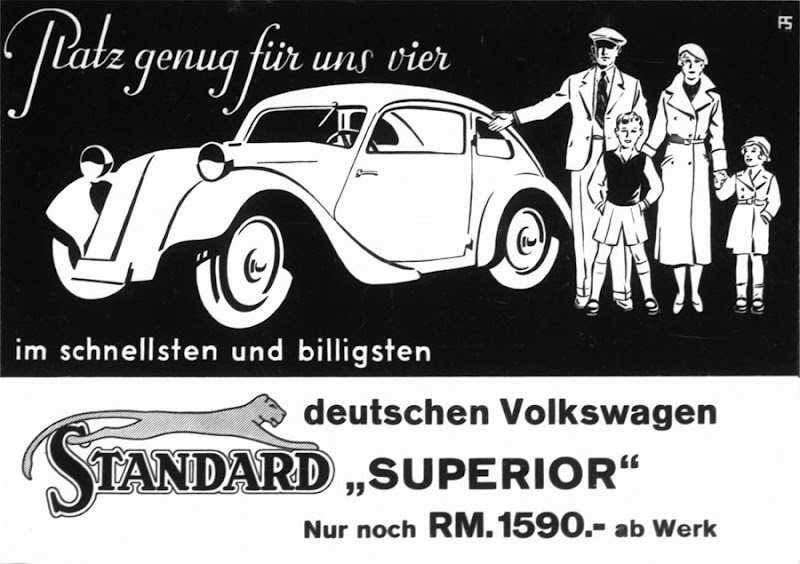 The Nazis not only “took” the concept of Ganz’s family car—their production model even ended up bearing the same nickname. In this biography, which reads like a thriller, Schilperoord tells how Ganz was arrested by the Gestapo, then fled Germany, and was hunted by the Nazis beyond Germany’s borders, narrowly escaping assassination. We are going to highlight a few examples from the book. Most of the hundreds of stunning photos in the book have never been published before and come from Ganz’s original photo archive, which Schilperoord discovered from sources in Canada and Australia. Josef Ganz was born in Budapest in the summer of 1898 and grew up in Vienna. Already as a child Josef Ganz displayed his engineering abilities. By the age of 12 he was granted his first patent for a safety device for electric streetcars. After serving in WWI Ganz moved to Germany, where he studied Mechanical Engineering. In 1923, as a student, Ganz started development of an innovative little car with a mid-mounted engine, independent wheel suspension, and a streamlined body. 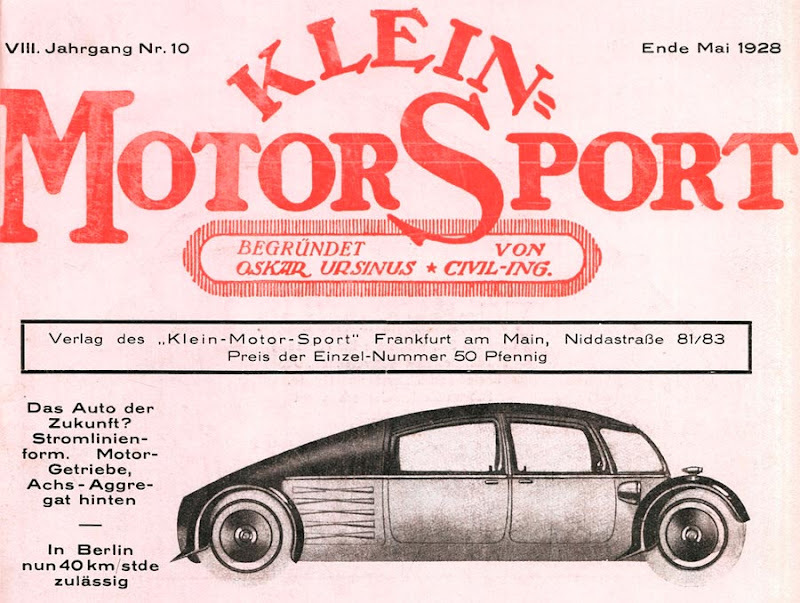 After a terrible motorcycle accident, in which Ganz almost list his right leg, developments of this Ganz-Klein-Wagen came to a temporary halt. Josef Ganz was a heavy critic of the old-fashioned cars produced in the 1920s, which he considered to be ‘devil’s carts’ with their solid axles, high centres of gravity, and inefficient drive trains. As a freelance journalist he started contributing articles to motoring magazines in which he urged the automotive industry to employ more state-of-the-art technology. This resulted into the appointment of Ganz as editor-in-chief of motoring magazine Klein-Motor-Sport. Ganz used this publication as a platform to promote innovative car design and the Volkswagen in particular. Because of his critical writing Ganz made no friends with the conservative car builders, but his magazine became highly influential. In 1929 Ganz changed the title into the more appropriate Motor-Kritik. 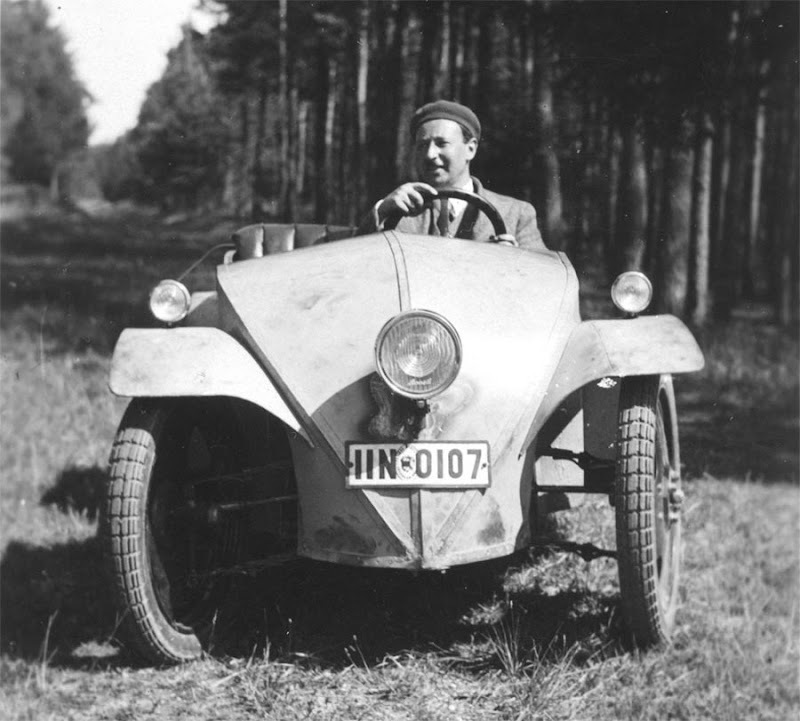 In 1930, the Ardie motorcycle company from Nuremberg gave Ganz the opportunity to build a first prototype of his Volkswagen. The prototype featured a central backbone chassis with a mid-mounted engine, independent all-round suspension with swing axles, and simple, open, beetle-shaped bodywork. Production plans, however, were halted when a consortium of leading German car manufacturers blocked a law-change proposal to let holders of a motorcycle-driving license operate such a small car. The remarkable construction attracted the attention of car manufacturer Adler from Frankfurt, which employed Ganz as a consulting engineer and offered him their facilities to build a new and improved prototype. Ganz completed this car in May 1931 and nicknamed his new brainchild the Maikäfer (May Bug). 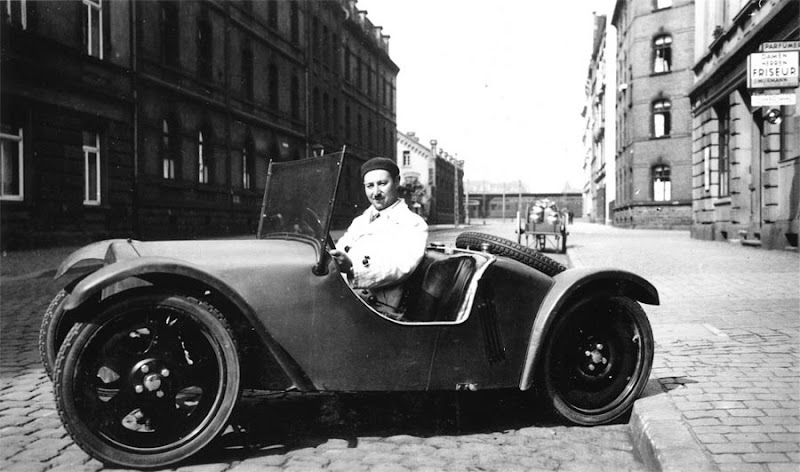 To comply with the conventional buying public, Ganz gave the car a more conventional looking, low-slung body with a fake radiator at the front. Just as had happened at Ardie, industrial forces blocked further development of the May Bug at Adler, but Ganz was allowed to keep the prototype. He used the May Bug as a technology demonstrator and took countless engineers and journalists on test-drives, proving the worth of his Volkswagen concept. 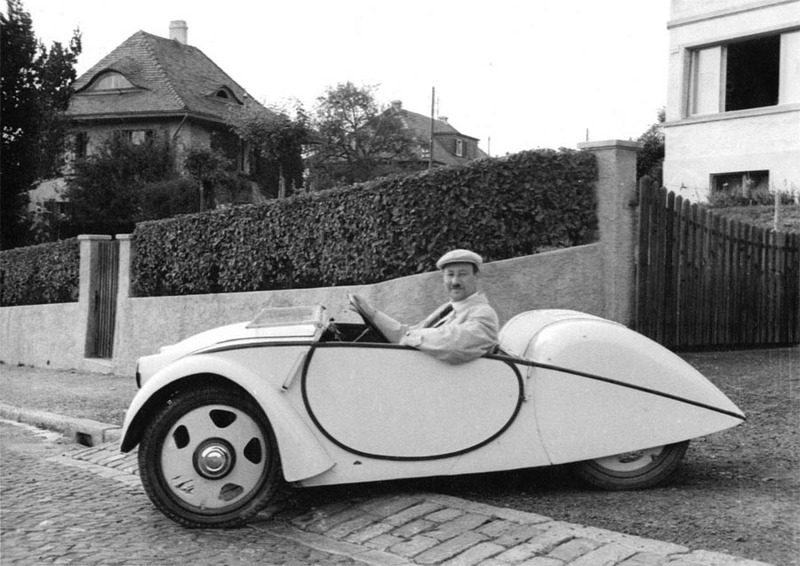 This included such people as Ferdinand Porsche, who tested the May Bug before designing a similar vehicle for the Zündapp motorcycle company. In the summer of 1931 the May Bug was transported by truck to Stuttgart, where it was severely tested by the board of directors and engineers of Mercedes-Benz. 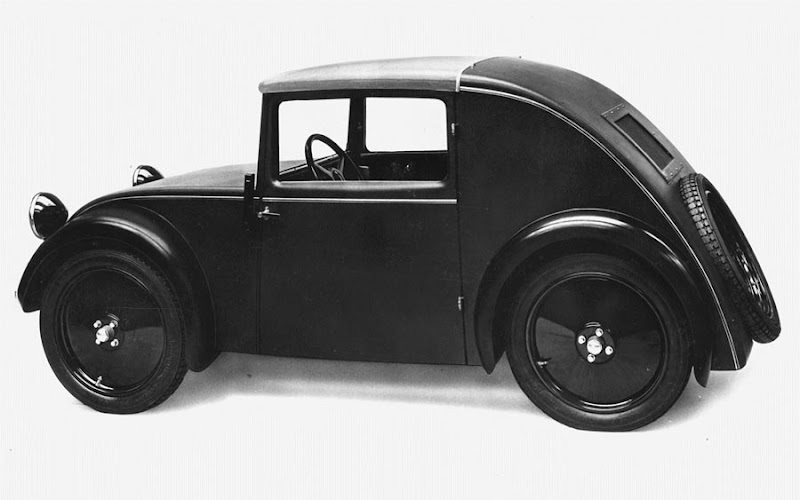 This resulted in the development of a Beetle-like car with a rear-mounted 4-cylinder boxer engine, designed with the assistance of Josef Ganz. He had by then been employed as a consultant engineer by both Mercedes-Benz and BMW. The May Bug had set off a bomb in the industry. Manufacturers that had previously fought Ganz and his Motor-Kritik to silence this critical voice now started adopting his revolutionary ideas. The race was one for who would be the first to create a successful rear-engined, lightweight, streamlined Volkswagen. Ganz, however, was the first to market a Volkswagen, backed by the motorcycle manufacturer Standard Fahrzeugfabrik from Ludwigsburg. 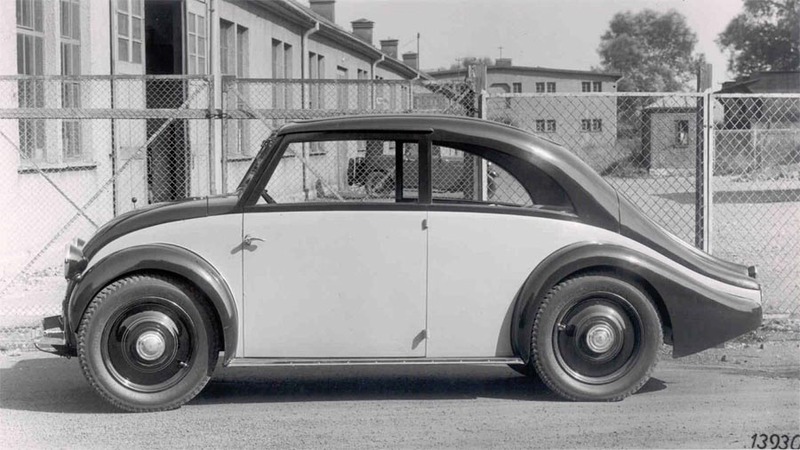 Using Ganz’s many patents they developed the Standard Superior, a production version of the May Bug with enclosed Beetle-like bodywork, which was introduced at the Berlin motor show in February 1933. Hitler had been appointed as Chancellor of Germany less than two weeks prior, and in this new capacity opened the motor show. He praised the work of the German engineers and during his tour of the exhibits expressed serious interest in the Standard Superior and the idea of a Volkswagen to motorize the German people. One of the first new laws introduced by his office was that holders of a motorcycle-driving license could operate small cars like the Standard Superior. A Standard Superior was even tested by the National Socialist Motor Corps and a favourable report appeared in the official army magazine. Then things took an unfavourable turn. The Gestapo falsely accused Josef Ganz of blackmailing the automotive industry and arrested him in Berlin in May 1933. Ganz was imprisoned for a month and was only released thanks to highly influential friends. Although he was released from prison, the Gestapo forced Ganz out of his positions as editor-in-chief of Motor-Kritik, and as consulting engineer at BMW and Mercedes-Benz. Hitler by then was determined to support the development of a Volkswagen for the German people. Having found no cooperation amongst the big car manufacturers, an independent development consortium was created, led by Ferdinand Porsche. As a Jew, Josef Ganz was an impossible choice. Porsche was now set the task to design a people’s car for 1,000 Reichsmark – a maximum selling price propagated by Ganz in Motor-Kritik. The Nazis made sure that any Jewish connections to the Volkswagen were erased from history. They banned Ganz from publishing, as well as the entire German press from publishing anything about him. Overnight the name Josef Ganz disappeared from the German motoring scene. Just three months later, during the frightful Night of the Long Knives, the Gestapo appeared at Ganz’s home in Frankfurt to arrest and most probably assassinate him. Ganz was saved from this horrific fate by extraordinary luck: he was on holiday in Switzerland to calm his nerves. He was later warned by a friend not to return to Germany. He only made one daring secret trip to salvage his archives from Frankfurt. After wondering around Europe for almost a year, Josef Ganz settled in Zurich in Switzerland. There he demonstrated the May Bug prototype and a Standard Superior before Swiss government officials and landed a contract to develop a ‘Swiss Volkswagen’ with state funding – exactly as Porsche was doing in Germany. The first prototypes of the Swiss Volkswagen were finished in 1937 and closely resembled Ganz’s original sketches from 1923. Production plans in Switzerland, France, and Poland came to an abrupt halt after the German army invaded Poland in 1939. Europe was at war. Josef Ganz survived the war in Switzerland, but faced many problems with a Swiss company trying to lay claims to his Volkswagen design, and Gestapo officers after his blood. These and other events resulted in lengthy court cases after the war. The Swiss Volkswagen was only produced in small numbers, as was a French variation called the Julien MM5. Leaving all of his problems in Europe behind, Josef Ganz emigrated to Australia in 1951. He found employment as an engineer at General Motors – Holden until health problems forced him into retirement. He suffered multiple heart attacks and practically became an invalid, spending his days at home working on his memoirs. Josef Ganz died in obscurity on July 26, 1967. Check out more info on author's and publisher's websites. Here is the link to buy this book from Amazon. What an amazing and inspiring story...it positively screams "Never give up"
List his leg = lost his leg. Minor detail, great story! Nice story and all, but may I suggest, that you'll do some research about Czechoslovakian Tatra automobiles including Hans Ledwinka, Erich Ubelacker and Paul Jarard? I was about to say the same thing about Tatra. In fact none of his designs matched any specific features of the volkswagen. They had different numbers of wheels, differenet transmissions, different engine designs, and different structural design. He may have been prolific but he never hit the nail on the head - unlike Ferdiand Porsche. This just perfectly typifies the sheer BS that oozes from this tribe wherever the third reich or WWII is concerned. Try re-reading this piece with a little skepticism. They way they leap from detail to detail screams lies of omission, and then fancy footwork leaves the reader to infer non-facts as facts. Ganz never marketed a "Volkswagen." He was given the chance to build a market prototype on the basis of his layout design, but then "To comply with the conventional buying public, Ganz gave the car a more conventional looking, low-slung body with a fake radiator at the front." Hmm. I see. Ok.
"Just as had happened at Ardie, industrial forces blocked further development of the May Bug at Adler[...]"
Get the book, and check footnotes like this one. Anyone who does will see that this kind of stuff never checks out. These guys lie A LOT. Even just looking closely at this review, it's clear that even the car that arguably had no descendance from Ganz' 'Maikäfer,' the Standard Superior, never looked like what we think of as a 'Volkswagen' until 1933, after Mercedes introduced its far-more beetle-resembling 120H in 1931, ostensibly with their designers benefitting from his 'assistance.' But then why do his postwar cars still look like his Maikäfer, i.e., nothing like a Volkswagen? "The Gestapo falsely accused Josef Ganz of blackmailing the automotive industry and arrested him in Berlin in May 1933. Ganz was imprisoned for a month and was only released thanks to highly influential friends." Well that leaves just a bit of room for muddling, doesn't it? "He only made one daring secret trip to salvage his archives from Frankfurt." BS! In the early 30s? Jews still owned half of Berlin at the END of the war! And how did the supposed moron and engineering nincompoop Ferdinand Porsche manage to accomplish anything without Ganz' miraculous help after the war? This whole thing is fishy. I like many other people who have chosen to comment find the article, and most likely the book it is based on, seriously flawed. However we didn't find it necessary to head off on an anti-Jewish rant. I had a interest about the ride of Hitler for a long time. Specially the losing leg. Hahahaha.........anyway nice story. In the meantime for your help I think this video goo.gl/BYMCd will really make you feel grateful! For shure he was an importand ingeneer who should not be forgotten, but it wasn't him alone who made streamlining and aircooled engines popular. Aircooling and streamlining is a good combination, because you don't need large openings for cooling. A air cooled enginge is usually alway equipped with a blower, and doesn't need the help of the airstream for cooling, so it can be place at the rear. For rear engines, you need a short engine and you have more width because of fixed wheels, so a boxer is a logical choise. Aircooled engines need a larger cylinder distance for cooling, boxers engines need the same because of the crank shaft stability, another reason why this combination was so popular. Aircooled engines are louder, so it is better to place them in the rear, this gives lower intirior noises.